For those of you that already use our salon for your hair colouring services are aware of how important we take your health & safety when it comes to skin testing. Every time you visit us for your colour service we ask you to confirm a few question regarding allergic reactions, skin conditions and notify us if you’ve had a tattoo or Microblading (Eye brow tattooing) carried out in recent weeks/days running up to your hair colour. If you’re new to Caprio’s Hair Studio then you will be invited to attend a Colour consultation prior to your colour service so we can carry out a skin test and ask you to complete a skin test card signing it to say you’ve received this service, this also includes existing clients. Why do we do this?………because even though you’ve most likely had numerous hair colours during your lifetime you can become allergic to anything at any time, medication can also play a major part in this. One of the most popular beauty services at the moment is Microblading which is when the eyebrows are tattooed to perfect and enhance the shape. If this is a service you’ve had done recently and you’re due to visit us for your colour then you will need to come in to the salon to have another skin test before we can colour your hair. If you don’t and you have had this service we won’t be able to perform your colour service that day which is bad news for both of us, you’ll be disappointed and have to re-schedule and we’ll be disappointed because we will have booked out a few hours to carry out your colour and unable to re fill that time. We know it can be a bind and that every bodies time is precious but this is important. No skin test….no colour! One of the questions on our skin test record card is to confirm that you’re not under the age of 16. If you are ,then again we will not be able to colour your hair. We’re not being mean or lazy we’re being professional and doing as much as we can to ensure your safety unlike some salons that not only colour childrens hair but don’t have a skin testing policy in place at all. Caprio’s Hair Studio is one of THE (if not THE) most professional salons in the area dedicated to making your hair the best it can be at an affordable price without compromising your health & safety or condition of your hair. The article below demonstrates how important it is you choose the right salon when visiting for a hair colour service. 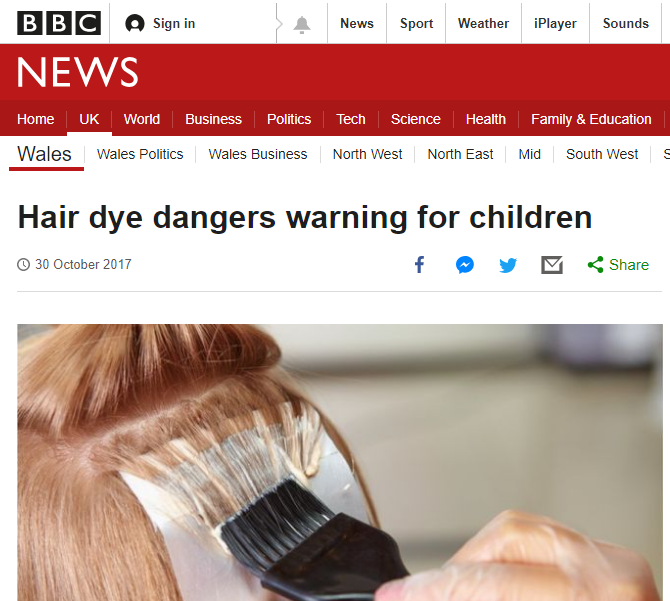 I was very disappointed and shocked to see so many salons were willing to colour children’s hair and not only that ….don’t have a skin testing policy in place.